Thanks for keeping topics focusing on gatekeeping of researchers and of the scientific community in the Truthers and shills forum. -H.P. hoi.polloi wrote: I see a parallel, and that's a positive response to what you're saying. But also a caution — visuals can distort for many reasons. In video, you can sometimes see complex color movement causing the most compression errors in an area. Eyes, lips, detailed writings/posters on the wall. Also, different compressions have weaknesses. JPGs don't do well with reds, for example. I would expect localized compression problems to occur consistently with this software, but we are not yet certain we are looking at the same software between the NASA hoaxes and terrorism/plane disaster hoaxes. What we can be more certain of is that their general simulation program — as an organization of people, management positions and hardware/software — continues to run into the same issues. Since the managers at the top are the ones likely to be the culprit — their poor supervision being the source of these problems they apparently don't care about — we might presume this pattern is from similar (if not same) software being run by similar (if not same) managers and that is damning enough as it is! Thank you for your response Hoi, and that's why you ask you, since you obviously know more about the glitch/compression issue, and help me learn what counter arguments I may run in to when debating fakery. I would like to add that I do not believe Jeff C/ Free Radio Revolution is a shill, but you never know as we all are aware of. His recent videos have raised red flags to me, and I hope he is just wrong about it instead of the other option which is fearmongering. He has done good research in the past, some funny music psy-op parodies, and I hope he gets back to that instead of this recent trend. I made a request for him to remove his video saying the plane crash is 100% real, and even his buddy Red Pill Revolution aka Truth Media Revolution agrees considering the large amount of evidence that proves its fakery. I guess we'll see where he stands if he doesn't remove this video In my last post. I share your concerns about that group. First of all, they make little mention of CluesForum when discussing 9/11, which is odd since we have fairly heavy proof that nobody died — or at least a plausible explanation that they fail to entertain. But if they can't see this "crash" is fake, I don't know what their game is. If they are shills, might their purpose be to just supplant and steal members off a stronger, bigger Fakeology network before it happens? I guess I am going off topic, but the point is this "accidentally documented plane crash" is anything but what it purports to be. 1)Why should we expect more videos coming up? 2)Why should the quantity of videos matter? hoi.polloi wrote: I share your concerns about that group. First of all, they make little mention of CluesForum when discussing 9/11, which is odd since we have fairly heavy proof that nobody died — or at least a plausible explanation that they fail to entertain. Hoi, I completely agree. Most of them act as if media fakery started in 2012, when it's been part of our society for generations. They believe nobody died in the psy-ops since Sandy Hook, but they can't believe that nobody died as a result of the events of 9/11??? I just don't understand their thinking in that case. Myself and Critical Mass discussed that the YouTube Truthers referred to 9/11 as half a hoax, and that makes no sense with 9/11. It's either a hoax or not. Me being a catastrophe property insurance adjuster, I can tell you first hand that Superstorm Sandy was a half hoax. The hurricane really happened, but the media overhyped the damage. I posted a photo here that I took that showed they staged the damage of a small city block but the rest of the buildings were mostly unscathed. They had a 30 day mandate for us adjusters to finish all of our claims, which I believe had to do with them covering up the fakery portion of the storm. I got A BP oil spill hoax story to share some other day in a different thread. As for this topic, I suggested to Free Radio/ Jeff C that he make a new video and delete the one he has now claiming the crash 100% real because of the overwhelming evidence the plane crash is cgi. He is misguiding his subscribers, which is Alex Jones-esque, and even his YouTube Community best friend agreed with my post. His video could cause a little damage to all of our collective media fakery research just because the disinfo could lead people searching for the truth down the wrong track. If he's a real researcher, he needs to accept responsibility that he is wrong when proven so. I constantly post info about fakery in their comment sections and always link to cluesforum to lead the YouTube subscribers down the right path, and my posts always end up the most popular of the comments, because most of these newly aware people are fascinated with the large archives we have here of so many subjects. Edit: I'd like to add that the "YouTube Community" considers the video they made "We Need to Talk About Sandy Hook" the most important psy-op documentary ever. Without September Clues, there would be no "We Need to Talk About Sandy Hook". Simon's videos and hell, even his posts are way more revealing and important than that video will ever be. September Clues will be a classic, and their Sandy Hook video will be long forgotten. Knapsack wrote: I'm finding this "plane crash" very, very interesting. My first exposure to this event was not long after it happened via a screenshot of the "moment of impact" on the top of The Daily Mail. I laughed out loud at the ridiculous-looking imagery and moved on. I wasn't surprised to see, later that day, that a number of channels I follow on YouTube were talking about this "crash" and calling it out as a hoax. What did surprise me was YouTube user Free Radio Revolution's vitriolic rants against all channels calling this a fake plane crash. For those who may not be aware of this guy, he claims to be Numero Uno with "hoaxes" and has "broken down more hoaxes than anyone! Period!" Har har har! While he does seem to devote his life to making YouTube videos about media fakery, I don't recall him being around for Tucson, Oslo/Utoya, or Aurora... let alone 7/7 or 9/11. While I have followed this guy for the past eight months or so, I've noticed some worrying things about him and most of the more popular YouTube "hoax-busting" channels. He claims that 9/11 was a "false flag" and that "people really died" and refuses to acknowledge the 9/11 VicSims. He very, very rarely (if ever) discusses the possibility of CGI, video layering, or Photoshop being used in these PsyOps. He views every video coming from the MSM to be "real, but staged" never being open to the idea of simulated realities. He's also often "fooled" by obvious disinfo such as the Grey State movie, which he promotes, and then comes out to "set the record straight." He also has never candidly talked about how he came to his current understanding ("being awake," as they like to call it) of the MSM's lies. I feel like all of us have a path to understanding that we had to go through, even if that path was mostly following in other investigators' footsteps. I find it questionable that he never discusses any forums such as this one where he gained some initial knowledge. I have a hard time believing that he discovered the phenomenon of VicSims on his own (and then also can't apply that knowledge to his understanding of 9/11... doh!). It's worrisome that the result of this plane "crash" is that it has sparked a resentment toward those of us who point to evidence of CGI and Photoshop in examining these psy ops. The critical examination of the videos and photos presented in conjunction with these psy ops is absolutely crucial to presenting a bullet proof case against the mainstream narrative. In fact, the video and photo evidence is often the only hard evidence we have to declare these things hoaxes. If it becomes taboo to question the authenticity of videos and photos, especially in this age where hyper-realistic CGI is a reality even in the private sector, the "truth movement" is absolutely doomed. The very likely reality is that the shadow government holds CGI technology that is basically indistinguishable from real life video, and the only way to distinguish the two is upon very close examination. And that process, my friend, is exactly what is being demonized right now... not by you, but by some very high profile people in this community who shall remain nameless. This is all part of steering the "truth movement" in a certain direction--in this case, away from research on CGI and video fakery. The sad reality is that many of the larger YouTube channels are wolves in sheep's clothing, and it's really not difficult to see that if you follow them for a while. Thank goodness there's still Cluesforum. I completely agree, and I feel that FreeRadioRevolution is now doing more damage to our research than helping. His buddy Truth Media Revolution/Red Pill Revolution has admitted to me that he is a fan of September Clues and even discussed 9/11 vicsims during their show "We'll Do It Live", while at the same time FreeRadio shrugged it off and he was the one who called 9/11 a half hoax. He doesn't really break any new research, and just reports what others have found. Like I said before, he's been more recently posting fearmongering videos, and I've called him out on this. He even tried to discredit myself earlier today when I proved his compression theory was wrong, and when I told him to man up and admit he's wrong, even his buddy Truth Media gave my post a like. Instead of doing that, he started posting videos made by his yes men that agree with him. Normally, this stupid hoax would be swept under the rug. Jeff C is no simonshack, and I really hope Simon proves this guy wrong, even though I feel I've already done that, nobody does it better than Simon, and I hope Simon humbles this guy to where Jeff just goes back to what he does best, which is reporting what other people have researched. Are you saying you had based your conclusion on just one screen shot? If that's the case, I don't think it is a good attitude. But maybe I am the one jumping to conclusions. And that process, my friend, is exactly what is being demonized right now... not by you, but by some very high profile people in this community who shall remain nameless. Is the last part not somewhat contradictory? If they are very high profile, they can hardly remain nameless. But I agree that Jef C is being very divisive on this issue, instead of just giving his opinion. I listened to Jef C's latest videos and I heard him make some strawman arguments, like "Its a hoax because other Asian crashes were a hoax". Here is short transcript I made from "we'll do it live": https://www.youtube.com/watch?v=RoOfGCCqO0g to show how he thinks about 911. Jef C: You are a no plane guy for 9/11 is that it? Red Pill Revolution: No, what I am saying is that the way that the planes went into the tower was impossible, we all know that. Jef C: So what are you saying? There is no planes involved in 911? RPR: No what I am saying is that we know they weren't regular planes, they were drones or whatever is the case. Maybe we can separate the discussion about what happened in Taipei from the discussion of how it is perceived on Youtube? I think it could be groupthink. No, I didn't base my conclusion on just one screen shot. However, upon seeing that one screenshot, my intuition screamed "fake fake fake!" I only came to the conclusion after seeing the different dash cam videos and a few of the early videos pointing out the layering errors. Sorry, I can see how that would read strangely--I quoted myself out of context. They are indeed high profile "hoax-busters," but what I meant is that they shall remain nameless in my comment. There was no need to call them out one by one. Seneca wrote: Maybe we can separate the discussion about what happened in Taipei from the discussion of how it is perceived on Youtube? Maybe a mod could snip this section and create a new thread in Truthers & Shills called something like "We'll Do It Live, Max Resistance, and Other YouTube Communities." 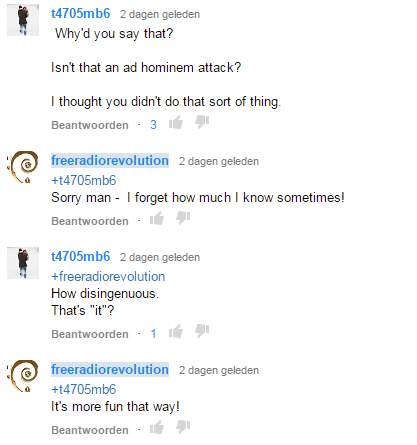 I posted a comment on Freeradiorevolution's latest video 'ZE PLANE ZE PLANE!' where I linked to the Taipei Plane Crash thread on this forum and asked him to explain himself. It got a couple of upvotes and a day later when I tried looking it up found out my comment was gone. It was erased without me receiving any notification of it. Perhaps Jeff C. is simply too proud to admit that he's wrong on this plane crash being a real event, but I'm seriously becoming convinced that he is a shill. Just look at some of his replies to some YT commenters calling him out on his strange behaviour in the comment section of his latest video. Like a shill he deflects every question with nonsense or an appeal to his authority. Weird. Thanks for documenting that. I could have guessed they were up to no good by seducing the Sandy Hook truth movement into a polished video, but I was hoping it was just a sea change — a coalition of well-meaning folks. It makes sense now, of course, why they seemed to have just "appeared" without a citation of (or reference to) truth videos/publications that inspired them, why there was little (if any?) mention of Simon's work or Gerard Holmgren's or Bill Kaysing's or NukeLies forum or other work that had been seriously looking into the hoaxes for years before them. They dare not credit others — dare not mention the work they are meant to distract from? It's very twisted and disappointing, but ultimately it does give us all a lesson in the lengths perps must go to slow people's critical thinking skills. It's refreshing to know people can see what we have been dealing with for a long time now. Maybe people will come to recognize when there is a disgusting betrayal occurring — learn to preempt it and get away from personality cults — or at least notice the conspicuous silence on forensics-type topics. It's not about holding a grudge, it's about knowing manipulators by their methods. Like an abuser, they will occasionally crawl back with flowers, before trying to tell everyone how to think again. It's so human, I guess, but disappointing. I have to admit I was looking for signs of a 'critical mass' & perhaps was giving these guys the benefit of the doubt... there may indeed be signs but this 'Youtube media fakery/crisis actor' community thing who seem to push that 'all media fakery began in 2012' are not it. You have ever seen what the REAL late stages of Ebola look like? They look nothing like this. It could be a real disease, but I doubt that Jef C. has real evidence for this claim. I'll post this also in our Ebola thread. Peter states that all the research here is just speculation, and no real investigation. Here's the kicker... For all the bashing this guy is doing of September Clues and Cluesforum, his most popular uploads to his YouTube channel are September Clues and Simon's other videos. To see more of this new shill (Or old one under new name), check the Simon a shill thread for my last couple posts. Could this Taipei Psy-op not only be about dividing the truth seeking community, but also a way for them to try to bash this forum? Maybe they are upset they couldn't divide this board like the YouTube Community??? They are trying their damnedest to discredit us, and I think we all should bring our A game to our research of this Taipei crash. If there is a payroll here, where's my check, and do you do direct deposit, Simon?